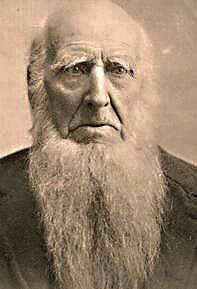 John Burris Smith was among the earliest gospel preachers to bring the message of being "Christians only" to Oregon. While we do not know a great deal about his life, we know enough to give him a place of honor in the development of the church in the Northwest. J. B. Smith was born in Madison County, Kentucky and migrated to Holt County, Missouri. Without a doubt, he was influenced in his developing years by the preaching of Barton W. Stone and John Mulkey. He married Emily Thorp in 1840 in Buchanan County, Missouri and joined a wagon train headed for Oregon in the spring of 1846. He was 30 and she was 22. Also in the spring of '46, Lindsay and Jesse Applegate opened the Applegate Trail through Southern Oregon, Nevada and to the south and east. Several members of the Stone-Campbell Movement were among the first emigrant train coming to Oregon by the southern route. Among them were John and Emily along with their daughters Cinderella, Melissa, Mary, Ellen and one son, William. John is probably the Rolling Pin Smith referred to in the Oregon Trail migration of 1846. The following story was passed down in our family by my maternal grandmother. At the time she related the story, no one in our family knew that John Burris Smith was our direct ancestor. Mr. Smith and others were traveling the Oregon Trail when Indians started to pursue them. In an effort to escape, he had to lighten the wagon as much as possible, and had to throw many items overboard. One of these items was a rolling pin, the only relic he had left from his deceased mother. Once Mr. Smith reached safety, despite being of strong fortitude, he broke down and cried considerably over the loss of the rolling pin. After that, he was tagged with the nickname Rolling Pin Smith. John was the fourth gospel preacher to enter Oregon Territory. Already preaching here were John Foster and Glen Owen Burnett. Dr. James McBride arrived the same year over the Barlow Road. In fact, Glen Owen Burnett frequently preached at the Jefferson Institute school house at Rickreall and the Smith's would settle near there. Profile of Glen O. Burnett. Profile of Dr. James McBride. 1846 - 1870 at Monmouth. 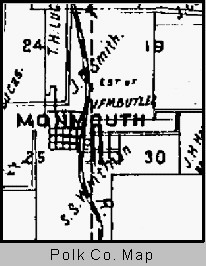 The men and women that would create Monmouth, Oregon, and build a church and school would not arrive from Monmouth, Illinois for another six years. It is likely that John and Emily attended church at the Jefferson Institute school house several miles north of their property, along with Emily's father and sister. Property was "free" for the earlier settlers and that was a strong motivation for many to hazard the trip from the Midwest. Each married settler was entitled to 640 acres or one square mile. The Smiths took their Donation Land Claim on the north edge of present-day Monmouth. John and Emily later were among the five Christian families that pooled land resources and provided for the establishment of what today is the city of Monmouth and Western Oregon University. The school has had a series of names, but was first known as Monmouth University. Western Oregon University lists John B. Smith as one of its eleven founders on its Website. Ten of those listed were members of the Stone-Campbell Movement. The Smith property shows clearly on the Polk County Map of 1882 shown at the right. The Smiths provided 80 acres for the community. The rest of the Smith property remained in his name until following his death. It can be interesting to see who their friends were. When the Smiths applied for their land, among the signers were Henry Hawkins, Gabriel Hardison and James S. Holman. None of the signers indicated they had known the Smiths since they were married. John B. Smith signed on the applications of Medders Vanderpool, John Bird Bounds, Fielden Thorp and Harrison Linville. All had been in the wagon trail of 1846. Most of the clan establishing Monmouth, including Isaac Smith, were related by marriage, but not John Smith. In reviewing the Butler Letters, John or Emily are not mentioned by the insiders. We conclude that they were social "outsiders" to the Monmouth clan. Some researchers believe that John and Isaac were twins, but the evidence is presently insufficient to merit this conclusion. Emily Thorp Smith's cousin lived just north of their property. Amanda Thorp became the wife of Marcus Ford, son of Nathaniel Ford of Rickreall, in 1847. Emily's uncle was John Thorp, who represented Polk County in the Territorial Legislature in the early 1850's. When Bethel College and Monmouth University combined at Monmouth in 1865, an entirely new board of trustees was formed and John Burris Smith was not among them. It appears those trustees from the two merging schools were excluded from membership in the new Christian College, as it was renamed. ". . . . On the 2nd Lord's day in June, Brother Smith from Willamette Valley preached, and immersed 1 lady." This is the first indication that John Burris Smith had preached outside of Polk County. In the 1860 census of Polk County, J. B. Smith told the census taker that he was a preacher. According to the same source, daughter Melissa Jane had married Thomas Strode and was living next door to the Smiths. They had a newborn son named Dillard. In three years Thomas would die in the Indian Wars and Melissa would marry his younger brother, also named Dillard. Following Emily's death, John moved to Douglas County in 1870 and lived on Clark's Branch Creek north of Myrtle Creek. From here, he traveled to preach in other parts of Oregon. John Burris Smith probably rode this stage between Roseburg and Myrtle Point. This was Bro. Smith's first visit, but we trust not the last. He is a workman indeed that is mighty in the Scriptures and needs not to be ashamed. His labors here were abundantly appreciated. In connection with our beloved Bro. J. B. Smith of Myrtle Creek and Bro. Hayes of Coquille City, we commenced meeting on Bear Creek near the mouth of the Coquille River . . . The meeting on Bear Creek was almost certainly at Parkersburg. The remnants of the town are across a meadow at the mouth of Bear Creek. Sawmills were installed in and near Parkersburg, beginning in 1867. A shipyard also played a role in the local economy. A successful fish canning operation began near the town in 1883. The gospel meeting was probably held in the hotel that is known to have been there. I send you a short correspondence respecting my meeting in Camas Valley. We had a happy meeting in connection with Bro. Morgan and our able and efficient Bro. Johnston. Eleven confessed their faith in Christ; nine baptized, one reclaimed and two to be baptized the first Lord's day in April. I have a protracted meeting at that time. I think we shall have several additions more at our next meeting. My labors are mostly confined to that portion of our county. I shall make a trip down to Coos county the first of May. The "Bro. Morgan" is Thomas McBride Morgan who was living in the area at that time. There is a profile of T. M. Morgan. Bro. J. B. Smith came to Oregon City last week, and I prevailed on him to go to Damascus with me on Saturday before the fourth Lord's day in this month. He preached two excellent discourses on Lord's day. I was compelled to return to the city on Monday, but the brethren prevailed on Bro. Smith to remain and preach for them. He held the meeting until Wednesday evening. He returned to the city Thursday on his way up the valley. J. B. Smith spent his final years living with his son Grandison and wife Nancy. Smith -- At the home of his son, G. D. Smith, on Clark's Branch, Feb. 6, 1901, Mr. J. B. Smith, aged 85 years, 1 month and 1 day. The deceased was one of the early pioneers, coming to Oregon across the plains with his wife and three children in 1846. He settled in Polk county, and the city of Monmouth now stands on a part of what was his donation claim. He was the father of 13 children and had 45 grandchildren and 26 great-grandchildren. He became a member of the Christian church in 1840 and a minister in 1852, and followed that calling until a few years ago when age prevented his further ministry. The funeral was held at Myrtle Creek, Feb. 7, 1901, at 11 o'clock. Rev. Richardson preached the funeral sermon, after which the remains were laid to rest in the Odd Fellows Cemetery. The 1900 census of Myrtle Creek shows the "Rev. Richardson" was Silas William Patterson Richardson who is listed as a clergyman. He is more widely known as S. W. P. Richardson, probably to distinguish himself from G. W. Richardson, another well-known gospel preacher of the time. Mr. Richardson himself was buried here just five month later. He is buried in lot 62, block 2, grave 2. We are convinced that J. B. Smith does not have a headstone in the IOOF Cemetery though he is buried there. In May of 2002, with the excellent cooperation of the managers and the local Myrtle Creek Family Funeral Home, we were able to locate, through records, where daughter Fleeta was buried without a grave marker. Her second husband, sawmill owner Moses True Dyer, was buried next to her and a John B. Smith was buried right there, but his birth and death dates were much later than John Burris Smith. Also buried a few steps away was a child with the last name of Bartle, probably a child of Fleeta Smith with her first husband, Fred Bartle. We concluded that this is the Smith family burial plot. Cemetery records show that several people named Smith are buried right there without markers or dates or first names in the records. One of these must be John Burris Smith. The Smith's had eight daughters and three sons. Cinderella married John C. Harris in 1853 and we find them at Days Creek in the late 1870s. Melissa married Dillard Strode and they were also at Days Creek. He became an elder there but had moved back to Myrtle Creek by the time of the 1900 census. Mary married Thomas J. Harris, probably a brother of John Harris. Another daughter, Fleeta, married John Bartle in 1876, then married Moses True Dyer in 1887. Barbara Reyman (Mrs. Rodney) of Reno is a descendent of John and Fleeta Bartle. John Burris Smith's Greater Family. Who were his brothers, sisters and parents? How does one trace a name like John Smith? The story becomes murkey and we have little evidence. But there is a little. At least one writer has suggested that Isaac Smith of Monmouth was the twin brother of J. B. Smith. This seems unlikely to this scribe. It is true they shared their last name, both lived at Monmouth at the same time and both belonged to the Christian Church. But J. B. Smith of Kentucky came over the Applegate Trail in 1846 while Isaac Smith came from Monmouth, Illinois with the Butler Emigration some years later. In the 16 letters that have been preserved coming from the Isaac Smith household, no mention is made of John or Emily. 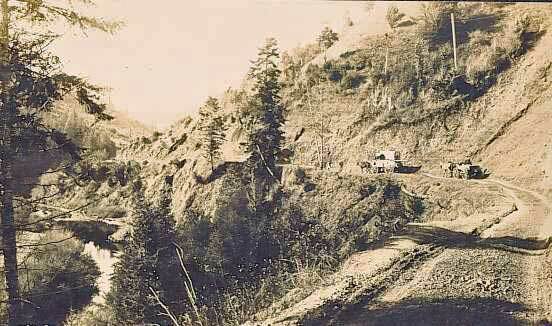 In the appendix of the Applegate Trail in Oregon in 1846 by Bert Webber, researcher Anne Billeter records the presence of John B. Smith and his family on journey (Page 157). She also notes that he was the brother of James D. Smith -- an overlander on the same trip. James D. Smith could well have been John's older brother. They are 13 years apart. James was married to Elizabeth M. Wright. But in the entry before James was Henry Smith, married to Susan T. Wright. James and Henry could have been brothers who married sisters, a common practice in that era. This would mean that Henry Smith was the younger brother of J. B. Smith. James D. and Elizabeth Smith settled at Lewisville, a short distance south of Monmouth. This was primarily a Christian Church community. Their son John married into the Lewis clan. James lived out his days at Lewisville. They were members of the Mill Creek Church in Marion County. He served in the state legislature in the early 1880s. One record said of Henry: "He was a strong supporter of the church by his faithful attendance and financial aid, his pocketbook having been converted with him." He built the church building in Aumsville. The mystery continues. Perhaps these clues will enable researchers to push the boundaries of discovery a few notches beyond the present.